I'll keep this brief (mainly because I don't have a lot to say). The other day I was doing my regular tour of the local charity shops. I had found nothing of interest (seriously, how many copies of Carol Vorderman's Sudoku get sent to charity on a daily basis? ), and I was about to give up. Just then, a small box with an intriguing logo caught my eye. 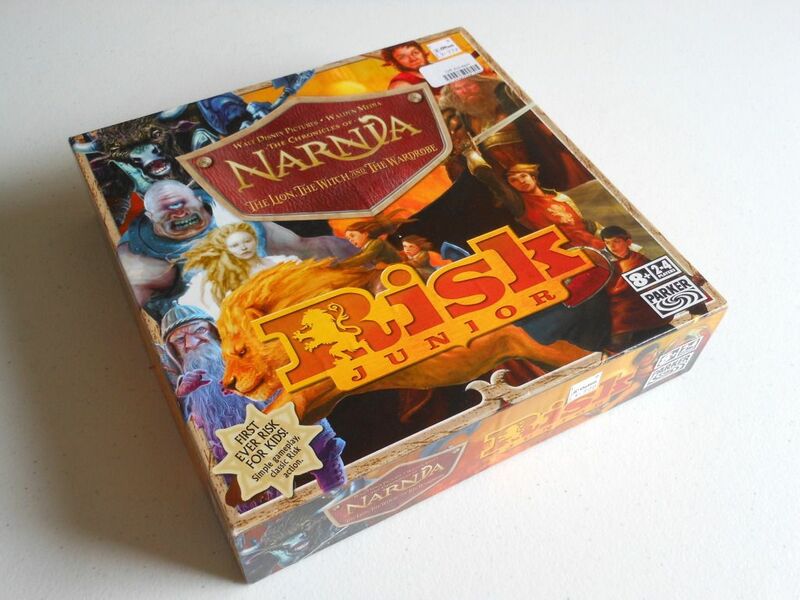 The logo said Risk Junior, and there was a cool lion insignia inside the "R" of the word Risk. A closer examination revealed this to be Risk themed around the movie The Lion, The Witch and The Wardrobe. Real artwork - not movie stills. Saints be praised! The box claims that this is the "first ever Risk for kids!" That seems strange to me, as I have always thought of Risk as a family game, and the age specified on this box was 8+. I don't really see children of aged eight having that much difficulty with regular Risk, which does beg the question whether this junior edition is necessary. Recently, I acquired a copy of Platoon, and I have also been reviewing some other games based on movies, such as Eragon and Indiana Jones Akator Temple Race Game; so I thought I would continue the trend and pick up this copy of Risk Junior too. Besides, I don't own a copy of Risk, and I am a sucker for a good fantasy theme. This game also got extra marks because, even though it is based on the movie, it uses proper artwork instead of movie stills. I dropped £3.99 for the game, and was pleased to find it was in excellent condition, and 100% complete (it even still had a little rules addendum slip tucked into the rule book). Inside the box - lots of plastic good guys. The box is surprisingly small, but it is packed with goodness. The board is nicely illustrated, and best of all, there are hundreds of little plastic fawns and centaurs to represent the armies fighting on Aslan's side. Slightly disappointingly, all of the White Witch's armies are represented by cardboard tokens. 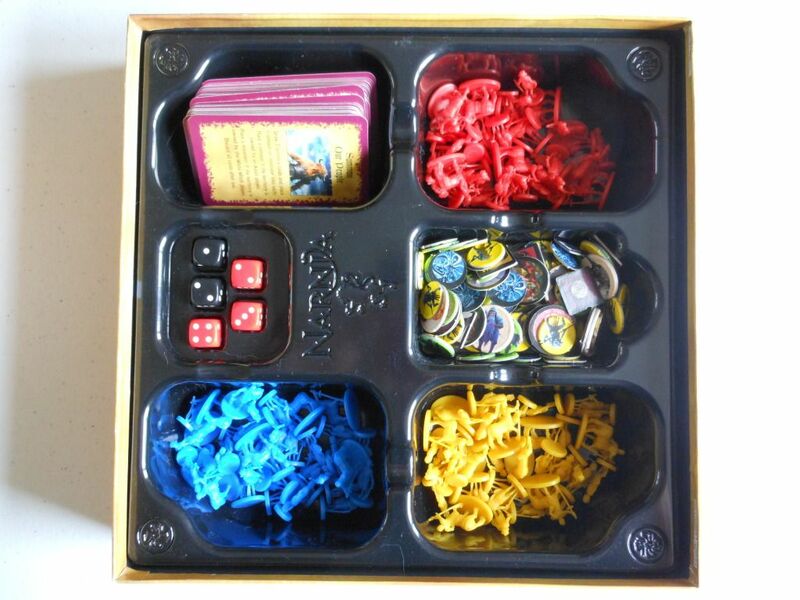 I guess the game's budget only extended to two different moulds and three colours of plastic. 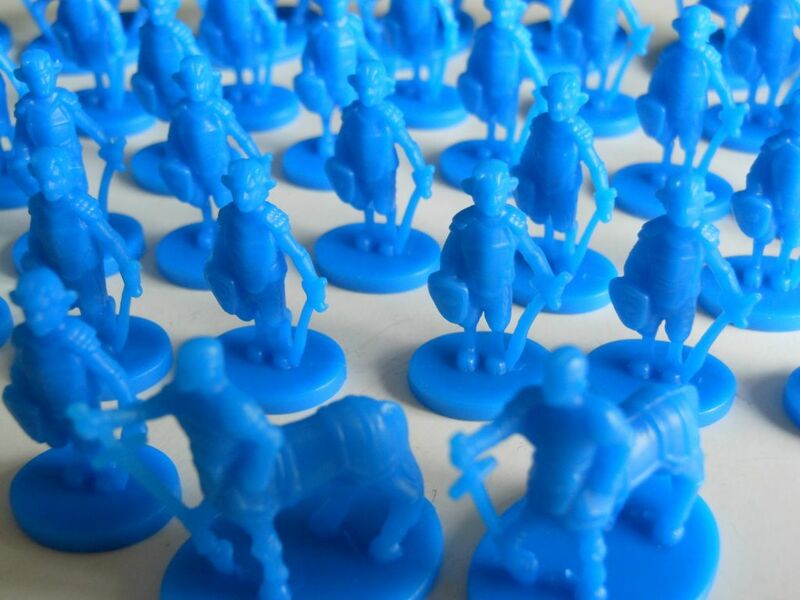 It's a shame, because I would have loved some little plastic minotaurs... 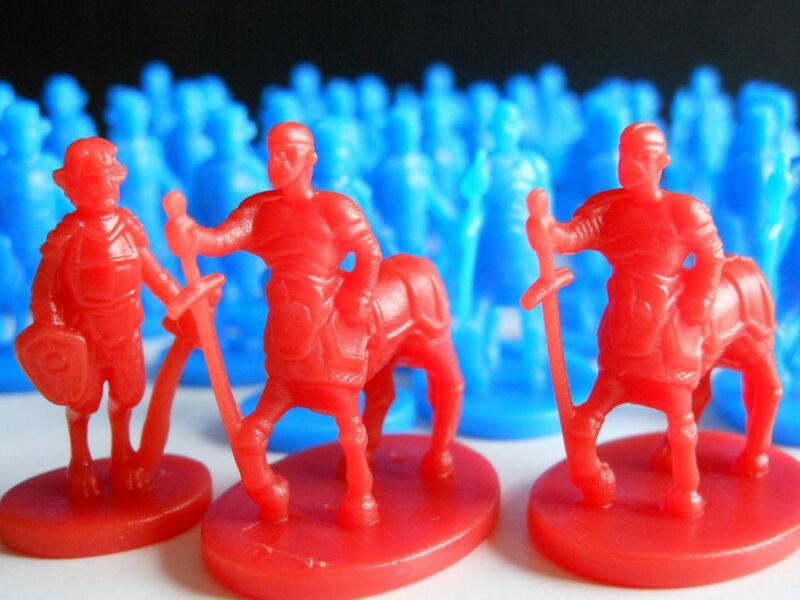 Although thinking about it, I have a copy of Age of Mythology which has loads of plastic figures in it. Maybe I could grab enough minotaurs from there. Big fawns, or tiny centaurs? You decide. The rules for this edition of Risk have been greatly simplified, and there seems to be a lot more randomness in it; but characters from the movie are nicely implemented with special powers, and it all looks very nice. I will certainly give it a play, and at some point a review will be added here on the blog. "I don't wish to alarm you, but I think we're being followed." Now, where's that copy of Age of Mythology?